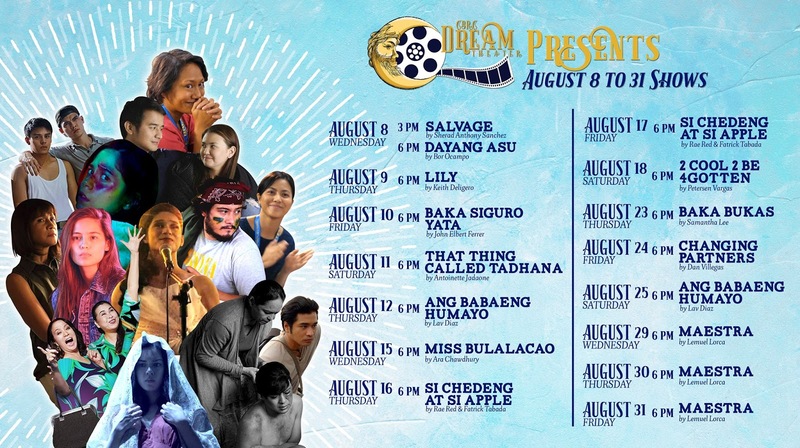 The CBRC Dream Theater presents the Cinema One Originals for the whole month of August 2018. For this month, the brave new stories of C1’s prized film festival will have a run here in Morayta, accessible to the U-Belt and España schools for the price of only PhP 150.00. Explore the wonderful narratives of Cinema One Originals, from the well-spun tales of aswangs and supernatural beings (SALVAGE & LILY) to unconventional romances (THAT THING CALLED TADHANA, BAKA BUKAS, BAKA SIGURO YATA & CHANGING PARTNERS), from coming-of-age (2 COOL 2 BE 4GOTTEN) to tales of mature adventures (SI CHEDENG AT SI APPLE), plus award-winning new classics that have won numerous awards here and abroad (MISS BULALACAO, DAYANG-ASU & ANG BABAENG HUMAYO). This special run will be capped by a screening of CBRC’s very own MAESTRA. Indeed, a celebration of indie spirit will commence this month at the CBRC Dream Theater.